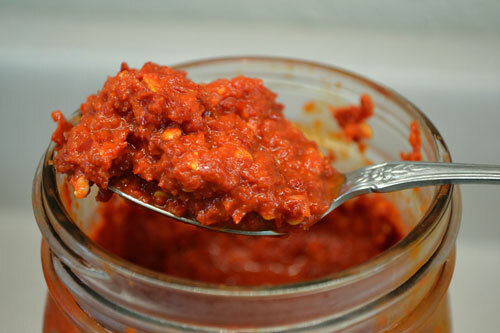 Fermented chile paste is one of my favorite toppings or condiments: I use it on eggs, sandwiches, in soups, stews and of course stir-frys. Most of the chile pastes found in Asian markets will be fermented to some degree, with those made in America less so. Fermenting your own puts you in the driver’s seat, as you get to choose what flavors go into the process and how hot or mild the result is. After you’ve made a batch or two, you’ll reach for your ‘special sauce’ before anything else! 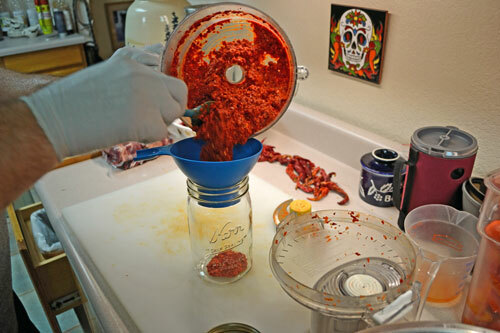 We’ve just made a different type of fermented chile paste and wanted to share the process with you. 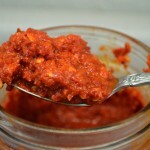 This is completely different than our other chile fermentation recipe – Fermented Pepper Sauce. This method is still a lacto-fermentation, but instead of depending on the natural lactobacillus bacteria on the chiles, it uses organic whole milk yogurt to jump-start the fermentation process. 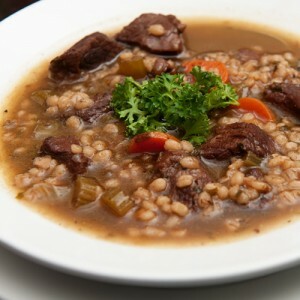 What we’ve found is that this method really adds to the complexity and roundness of the flavors while decreasing the heat considerably. This is so delicious that a small dollop goes well on top of real vanilla ice cream! 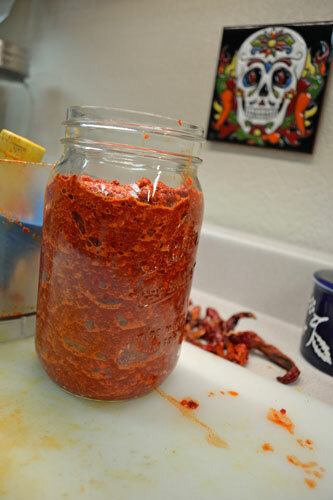 This is a very quick recipe – our fermented chile paste was finished in just about 4 – 5 days, instead of a couple of weeks to a month for the more traditional lacto-fermentation. We hardly saw any bubbling in the air pockets, with none on top. Because of the yogurt culture providing the fermentation engine, we didn’t need to cover the chile mixture with water and then strain it out later. 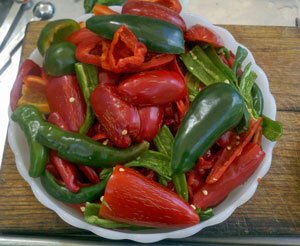 The chiles we used were heirloom Anaheim and Serrano chiles, with only about 10% being Serranos. I used the Anaheims for the mildness and well-rounded flavors, with the Serranos, providing a different flavor dimension and some good heat. I just cut the stems off of the Anaheims, but seeded, de-veined and de-stemmed the Serranos and the initial mixture was still pretty shockingly hot! The heat was an immediate, front-of-the-tongue heat which is typical for Serranos. The initial odor was unmistakably sharp fresh chiles and garlic, but after one day it smoothed out and had a very pleasant odor. After two days it started to smell very mellow with sauerkraut overtones and the chile/garlic combination fading. When it was finished the two odors were pretty well balanced, with the flavor being remarkably smooth, rich and long lasting. The heat had really mellowed, to a very moderate background that never intruded or was uncomfortable, only adding to the experience. Note – to peel garlic painlessly, watch our short video Peel Garlic in 10 Seconds! 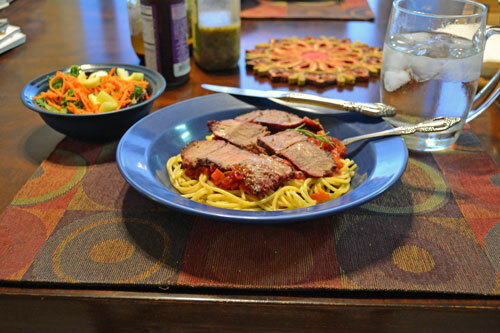 Here’s what could come out of your garden for this recipe – Chiles and Lemongrass! A very quick and unusual fermentation that uses yogurt to start the fermentation. Absolutely delicious, the chiles heat is greatly moderated by the fermenting process, adding complexity and a great depth of flavor. 1/4 cup organic whole milk yogurt you want as many live cultures as possible! Make sure the fermentation jar is extremely clean - wash with very hot soapy water and rinse very well. Wash, de-stem the chiles, removing seeds and veins if you want. Remove any bad spots. The seeds and veins contain the capsaicin, or heat. Milder chiles won't add much heat, but hotter ones will. 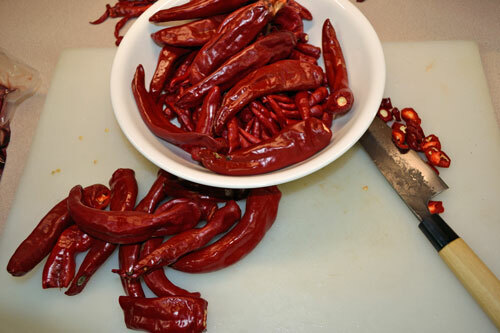 I usually remove the seeds and stems from the really hot chiles for a better flavor that more people can enjoy. Add chiles, garlic and ginger or lemongrass pieces to food processor. Pulse until finely chopped into a paste. Use your judgement as to how fine of a paste to form. Stop and scrape the bowl down to make sure everything is chopped well. If the mixture gets thick and won't move in the bowl, add 1/4 cup water to make it looser. Add salt - if processor is full, add 3 Tbsp, if over half full, add 2 Tbsp and if half full, add 1 Tbsp. Add yogurt and pulse again to mix in. Transfer the paste to the 1/2 gallon jar for fermenting. Replace the screw lid loosely, to keep insects out but allow pressure build up to vent. Place the jar where you can observe it daily while it ferments, but not in the refrigerator yet. Daily, remove the lid, stir, smell and taste the mixture. You will see some bubbles and possibly some mold forming. 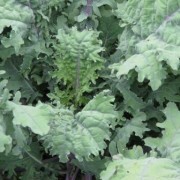 White mold is good - do not be worried with white mold! Any other color is cause for concern - usually due to jar not being extremely clean or chiles not thoroughly washed. Stir any white mold into mixture. Store in refrigerator to slow down fermentation and enjoy! When the flavors are to your liking, it is done. If left alone, the fermentation will continue for a month or more, so don't feel you have to wait on it. Make sure that you have at least one full inch of headspace between the top of the chile paste and the lid, otherwise it can bubble over and make a mess. 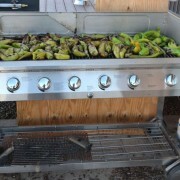 We started with fully ripe heirloom Anaheim and Serrano chiles – the Anaheims for flavor with the Serranos providing a nice heat. 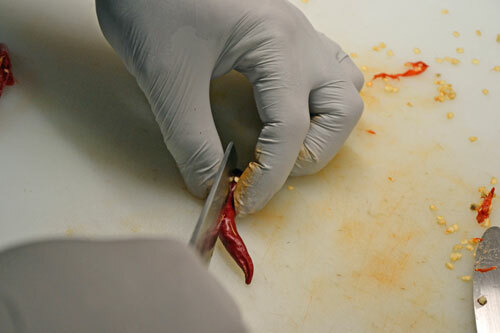 The next step was to remove the ‘heat’ from the Serrano chiles by removing the veins and seeds. These contain the capsaicin which is a yellow oil in the seeds and along the veins. 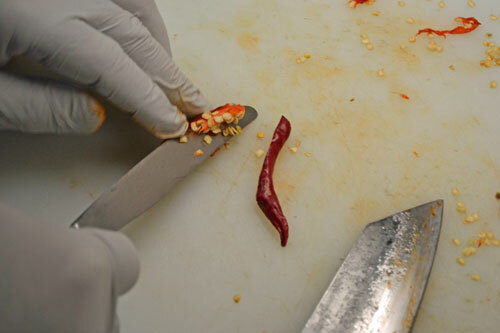 A butter knife worked well to slip into the chile and remove seeds and veins all at once. Note the disposable gloves to protect my hands now and eyes later! After the chiles and garlic were chopped up in the food processor, the yogurt and salt were added, then pulsed to mix in well. Be careful when pushing the chile mixture down to keep your face away from the opening, as it can be quite pungent, depending on your chile selection! 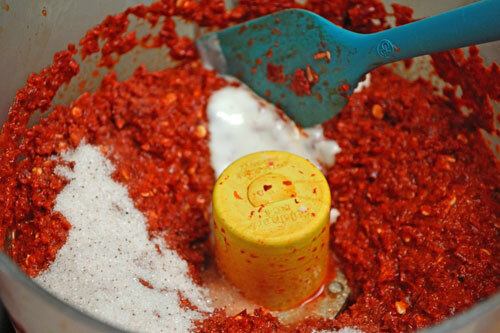 After the yogurt and salt are added, the chile mixture is transferred to the fermenting jar. We started with the quart jar, but it was too full so we transferred to a half gallon to give it enough space. After about 5 days, the fermented chile paste was ready to go. It started to mellow in the aroma after the 2nd day, and by the 4th it had a sauerkraut odor with undertones of chile – surprisingly delicious! We transferred the paste back into a quart jar to store in the refrigerator. The final product glamour shot! Can this be made with reconstituted dried red chiles? I’m a little late now! I don’t think that the dried chiles would work as well, but it would be worth giving it a small try as an experiment. This looks beautiful and tasty too! I will definitely try this next summer! We cant get organic peppers around here so I will use the ones I grow. This last summer it was so hot and a lot of sunny days that all my peppers did so well. I had so many that I ended up drying them and then I put them in the blender and now iam enjoying hot pepper powder, not big flakes. I sprinkle it on everything. I will surely try this recipe! Thanks for sharing! Do you make kimchee? Thanks Jeanne, we’ve got 2 quarts and a half gallon jar of fermented chile paste in the fridge to last the winter. I’ve made kimchee, but not in awhile. 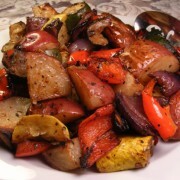 Might be time to do some more and show folks how easy it is when we have fresh veggies! Just made a batch and wanted to ask can you ferment this for longer than 4-5 days to get a deeper fermented flavor? Absolutely! Depending on how much of a fermented flavor you want, taste it daily. Then you can stop the fermentation by putting it in the refrigerator. Can this be made without the yoghurt? My wife is allergic to milk but I really want to make some of this! Nico, Yes you can! It will taste slightly different, but the fermentation will be the same.